Clairefontaine developed Pastelmat to meet the specific expectations of the most demanding pastel artists. This 170 lb (360 gsm) card is also an ideal surface for pencil and charcoal. The character "fixing" of this surface is so extraordinary that the positioning of multiple layers of pastels, and the realization of flat tints, precise details, or delicate and transparent veils are easily achieved. The use of fixative is not necessary with Pastelmat. The rigidity, weight, and non-acidity, as well as the paper's light-resistance, guarantee conservation of your artwork. However, it is recommended that a sheet of acid-free translucent paper be placed over finished artworks created on Pastelmat. White — These pads contain 12 sheets of White Pastelmat card. 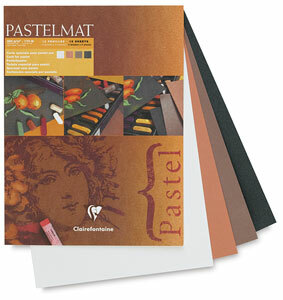 Selection A Colors — These pads contain 12 sheets of Pastelmat card, including 3 sheets each of Anthracite, Brown, Sienna, and White. Selection B Colors — These pads contain 12 sheets of Pastelmat card, including 3 sheets each of Buttercup, Dark Gray, Light Gray, and Maize.